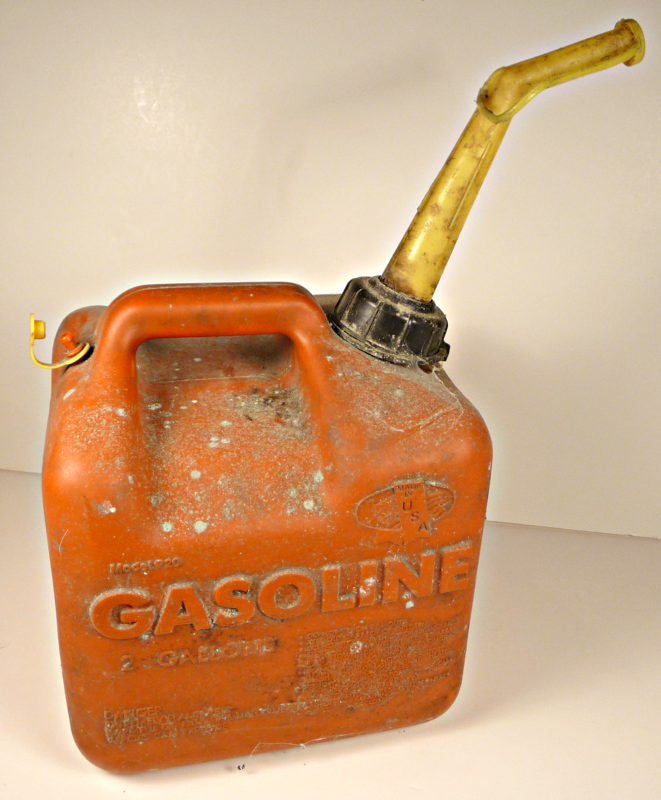 From Our Subscribers: “Paul, I replaced an old gas can recently. 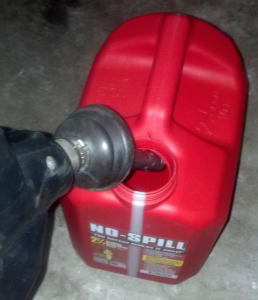 The new government regs make using this new one so clumsy I usually end up spilling gas on my hot motors, floor or clothes, especially when the can is full. It also pours so slowly you get tired holding the 15 lbs (2.5 gal) of fuel in the air for so long. Does anybody make a fuel can that actually works well anymore?” Chris G.
PG: “Chris, you’re experiencing what many people have found over the last few years since the new safety and EPA regulations for gas cans came into place. 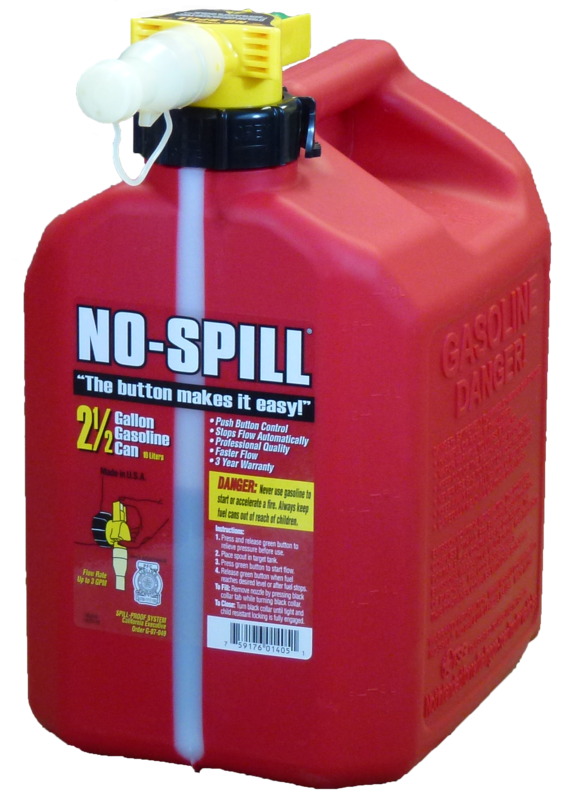 Awkward spout locks, clumsy telescoping flow controls and air intakes inside the pour spout that really extend filling time, have made most new gas cans simply frustrating to use. There are only a few manufactures that make these cans. But our research found one company that has developed an excellent, patented design, that exceeds all the government regulations, and works great! 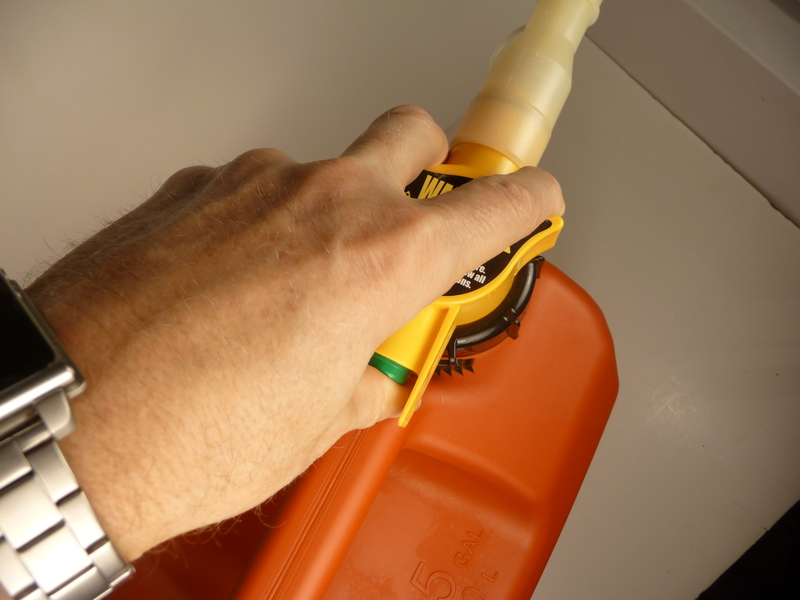 The fact is, most of us think very little about what gas can we have…….until we go to use it. If you have a very old gas can, made of plastic or metal, it will likely have an air vent located at the back of the can. To pour gas you simply needed to uncap the spout (if the cap hadn’t been lost), open the vent and pour away. This system allowed you to often pour up to 5+ gallons per minute. Fast and easy. 1.) Gas fumes, much more than the gas itself, are very volatile. 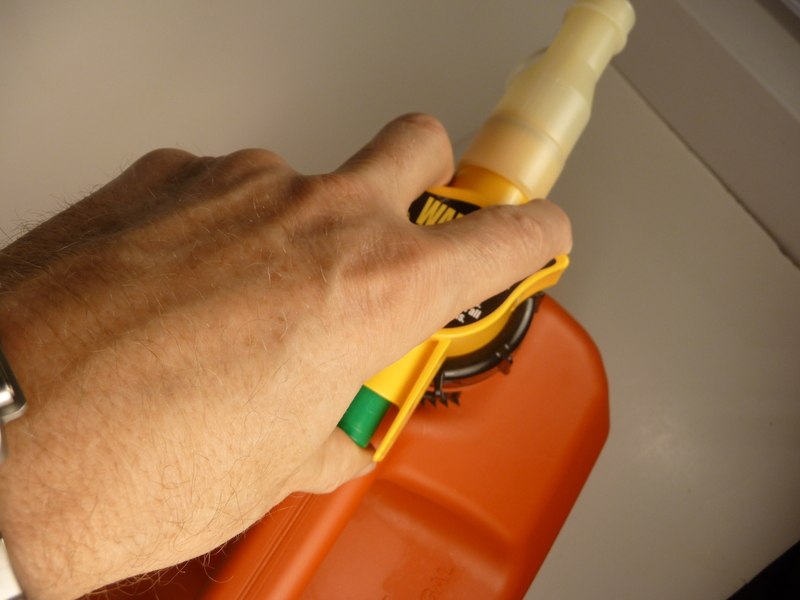 An open vent on a gas can is constantly leaking these potentially explosive fumes into the air surrounding the can. A spark, cigarette, or open flame of any kind can cause the fumes to suddenly ignite, especially in a closed area like a garage, basement or shed. 2.) These same open can fumes continually vent hydrocarbons into the atmosphere, which becomes significant when you consider the many thousands of unsealed gas cans across the nation (and the world) contributing damage to both our air quality and the protective layer between us and the sun. 3.) 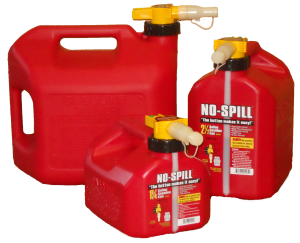 A dropped or knocked over can could quickly spill gas across the floor, ground or on people, creating a serious safety and clean up hazard. 4.) Children could easily cause gas to flow from the can or be exposed to gas fumes, with potentially harmful consequences. guidelines to require all gas cans to conform to both safety and environmental minimum standards. 1.) Clumsy and awkward to control and hold. 2.) The Flow Control can be difficult to regulate, especially when filling smaller tanks, like on gas powered leaf blowers, string trimmers, etc. 3.) The gallons per minute flow is now often in the range of 1.4 gallons per minute (gpm), causing you to hold a heavy can in the air (15 lbs for 2.5 gals, 30 lbs for 5 gals.) for significantly longer times. 4.) In our tests, they often created more “spill opportunities” due to the awkward flow activation methods and tank handling required to make them work. Simply put, a pain in the A. Lever Flow Release: This design has a wide lever attached to the spout with a sliding safety release that must move forward to release the lever that allows the gas to flow. If you stop the flow for a moment, you need to re-release the safety slider, and re-press the lever to restart the flow. This makes bringing a tank up to full without spilling very awkward. Telescopic Flow Release: This design uses a telescoping, spring loaded pour spout. 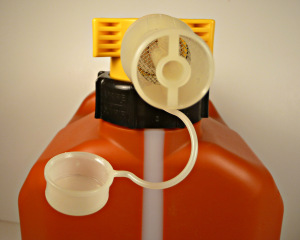 To open the flow you usually need to turn a safety release on the spout, then hook a notch on the spout onto the rim of the gas tank you’re filling and push forward on the can, shifting the weight forward to compress the spout and open the flow. 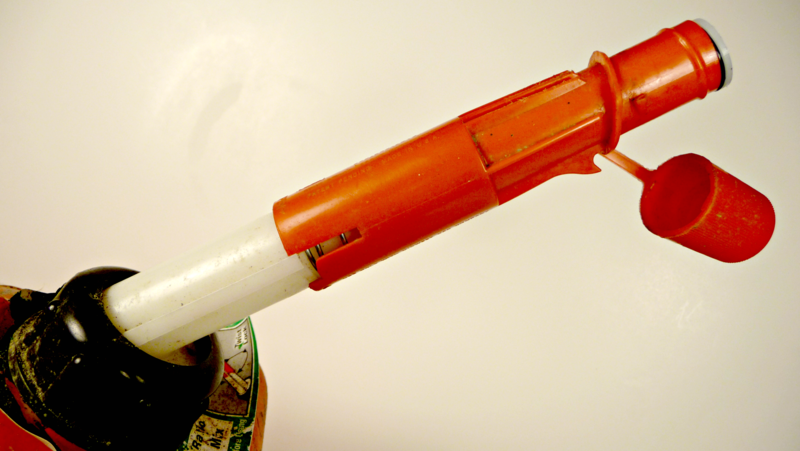 Another version of this telescopic design also uses a hook on the spout to push against, but the flow stopper protrudes from the end of the spout when compressed. 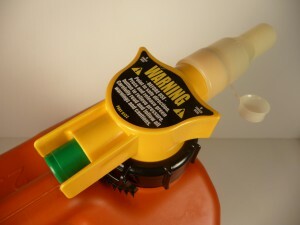 Although this design does have an advantage of automatically stopping the flow when the tip becomes immersed below the gas level during a fill, holding the notch in position against the tank rim without slipping off (which immediately closes the flow stopper) is clumsy and the spout frequently gasps for air. In our tests it also resulted in gas spilling onto the machine (and our shoes) when we were attempting to hook the notch on the rim or when it slipped off suddenly as the gas in the can shifted its weight. Easy to do especially when you’re holding the can in freezing weather. This was particularly true when the gas can was full. Button Flow Control: This patented design, used by only one company, No-Spill, did not have to be changed from its basic design when the new regulations arrived, as they had already solved the fume and safety issues. This system uses a Button Activated flow control that allows precise filling of even small tanks with no spilling of fuel or fumes. 1.) The nozzle design allows you to precisely control the flow of fuel, no matter how large or small the tank you need to fill is. And how full the can is has no effect on your control of the flow. 3.) You can easily, precisely top off a mower, generator, or trimmer sized tank with great control. 5.) 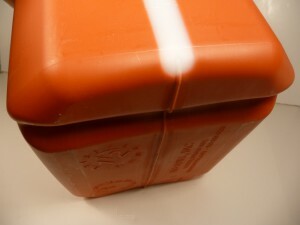 There is an underside hand grip notch to help make pouring control more stable. 6.) They are made from a thicker, professional grade, molded plastic that is highly resistant to splitting, bursting (if dropped) or punctures when used at home or on the work site. 7.) 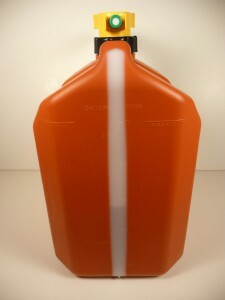 It has a wide mouth fill opening to make refilling it at the gas station safer. The larger diameter opening makes it easier to see when the can is getting full. That in conjunction with the front and rear view strips showing you the level as you fill, makes refilling the can clean and spill free. This also means you’re not putting a “spilled-on” gas can into your car for the ride home. Coupled with the self-sealing vent system, it should make chauffeuring your gas can around odor-free. 8.) 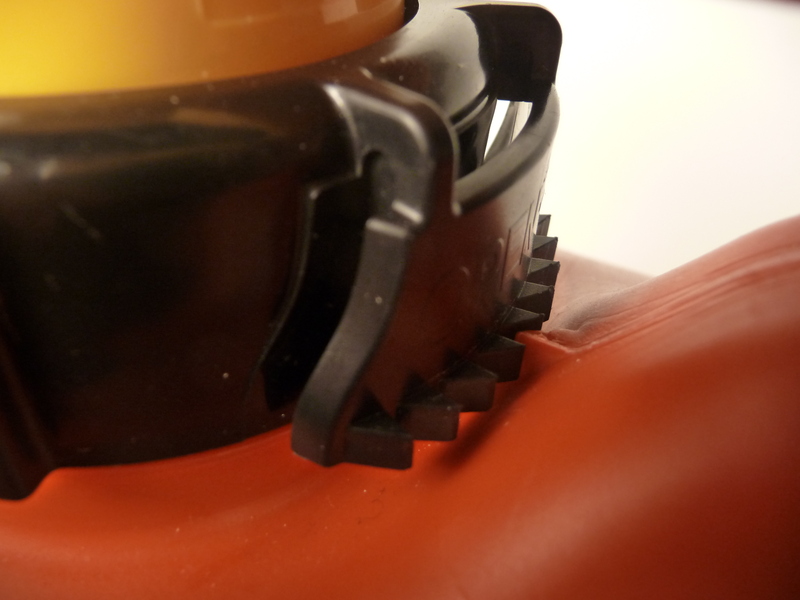 Their nozzle design includes a mesh screen at the rear of the fuel nozzle to prevent bugs or other air born debris from getting back up the spout and into your clean fuel. 9.) The Tank Cap design prevents over-tightening that could permanently distort the sealing “O”ring. “O” rings can be permanently deformed if they are compressed more than 40%. No-Spill engineered the closure cap to never allow more than 30% compression, even if the cap is fully cranked down. (Not necessary to create a good seal.) 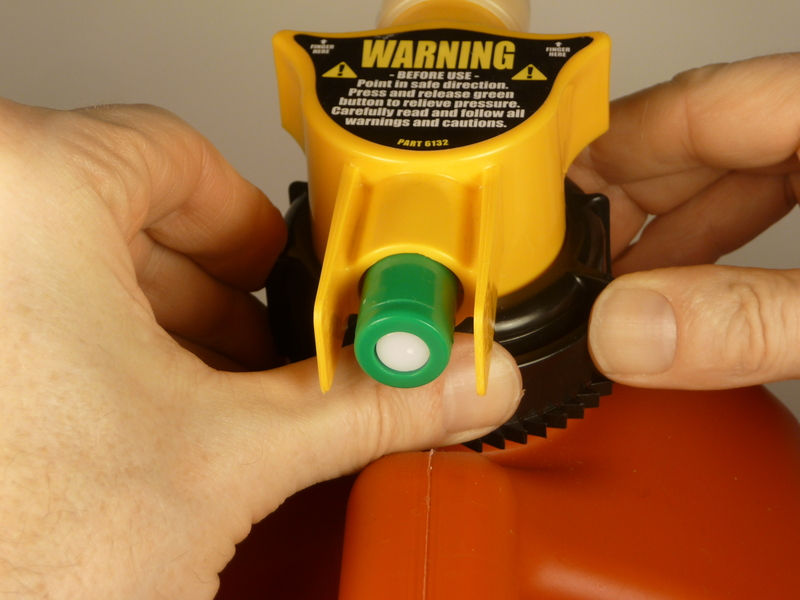 In our tests, 4-5 clicks on the cap ratchet were plenty to keep the cap tight and sealed. 10.) 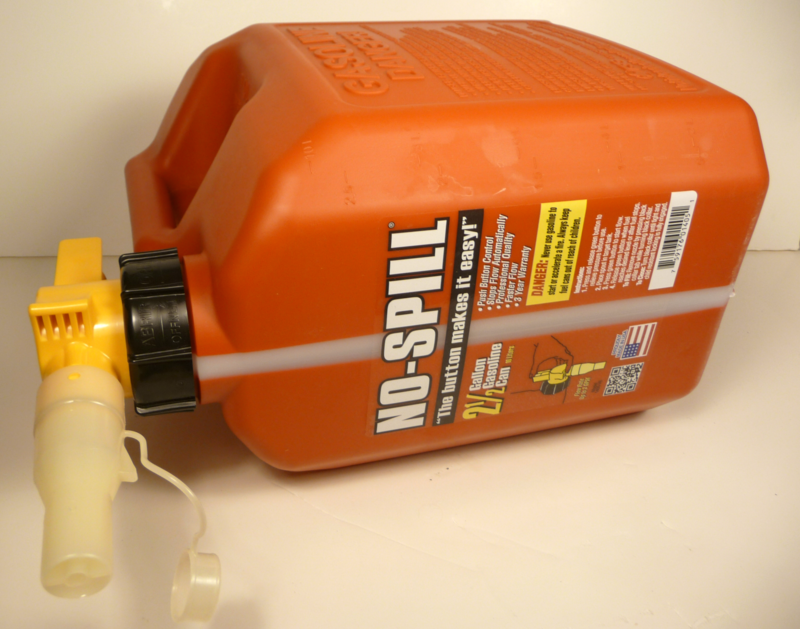 The No-Spill can has a flow rate of up to 2.9 gallons per minute. Not as fast as the old style cans, but it is top of the class in fast compared to other EPA conforming designs. (around 1.4-1.5 gpm). This means less time holding a heavy gas can in the air. If you need a longer reach, there is also an extension nozzle available. 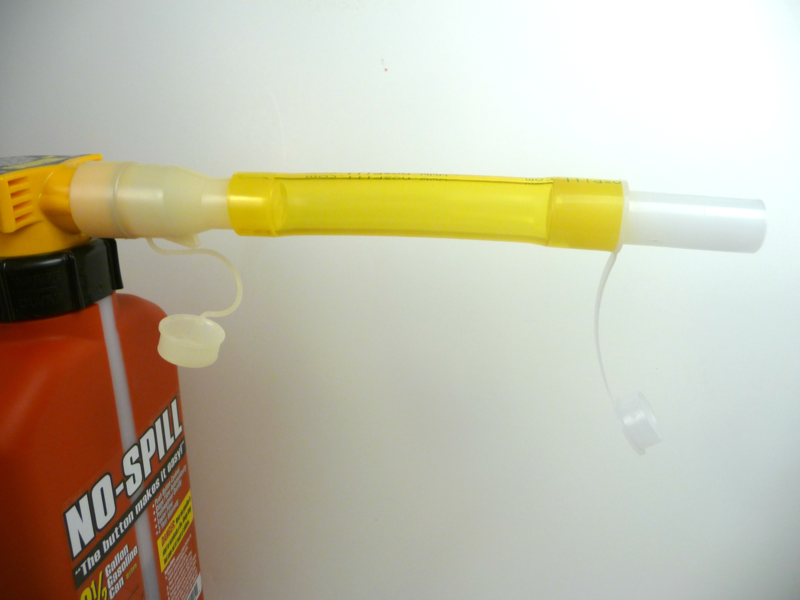 Because the on-board No-Spill nozzle was designed to fill a wide variety of motorized, off road tools, (the primary market for small to medium sized gas cans), they make a 6″ (accessory) extension nozzle that quickly attaches to the existing nozzle when you need to fill an automobile or other on-road vehicle. The extension will hold the filler door open inside the automobile’s gas tank, uses a high quality, transparent, fuel rated hose that won’t be eaten by gas (like many plastic hoses) and allows you to see the flow. 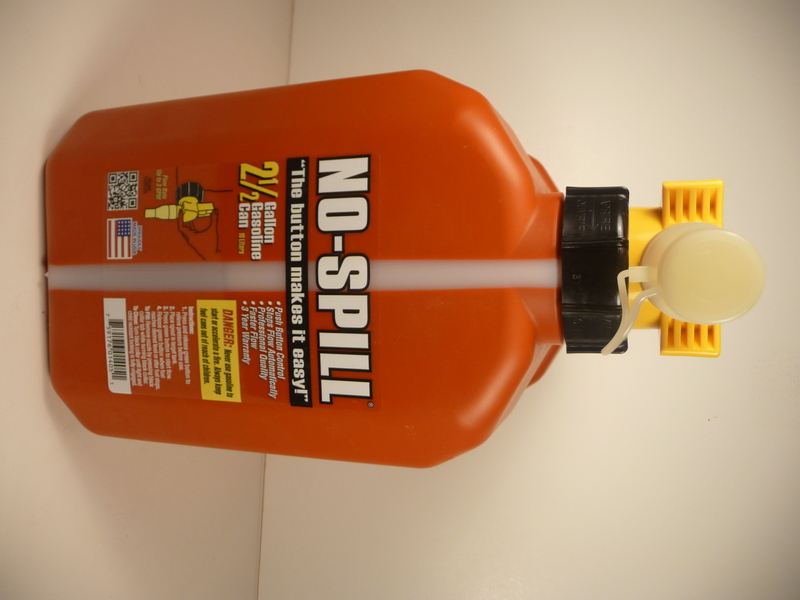 If you push the extension tip at least 2″ inside the car’s tank, the auto-stop feature of the No-Spill can still operate and stop the flow automatically. However, when using the extension nozzle, the flow rate will drop to around 1.5 gpm because the extended tube can’t pull air in as quickly. Important Note: When the fuel does automatically stop, Remember that you need to release the flow button and watch the last ~2 oz. 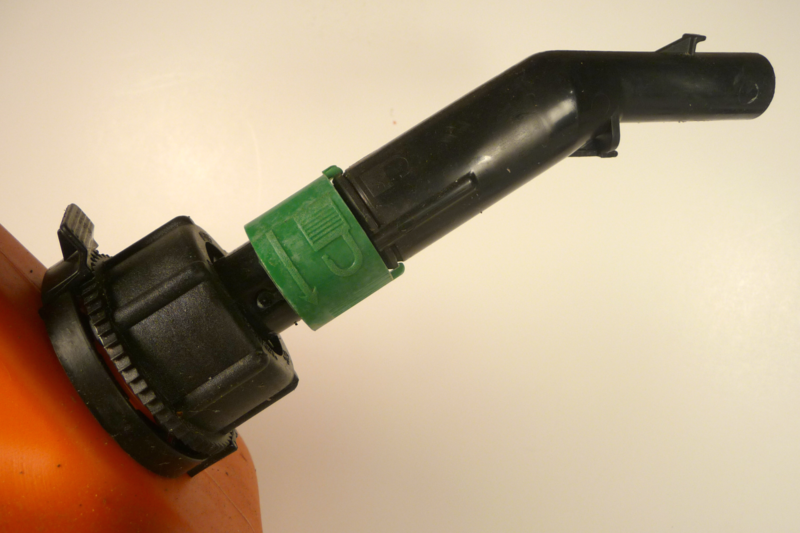 of fuel still in the extension hose drain into the tank Before you remove the hose from the tank! (unless you like a little petro spit shine on your shoes). To Remove the Extension Hose From the Nozzle, don’t try to pull it off. It will just get tighter. (A little like the Mexican fingercuffs trick.) 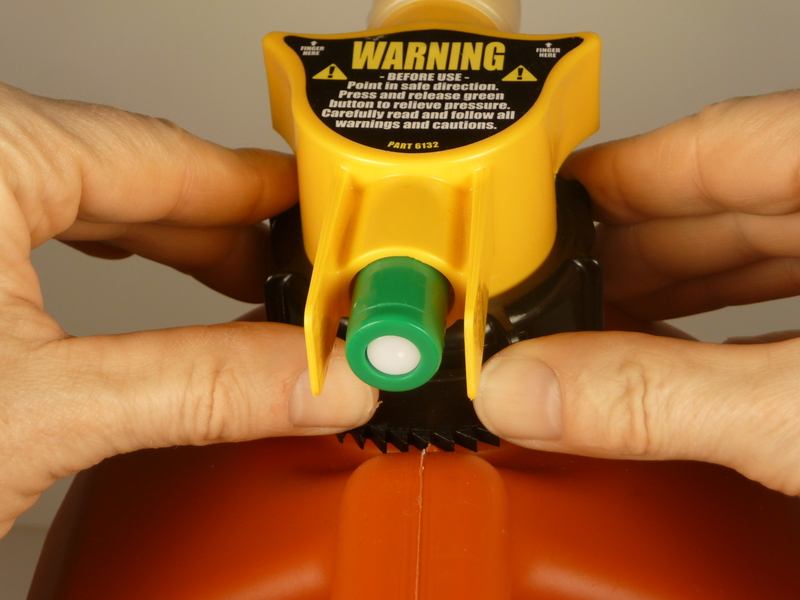 You want to push it off from the back edge of the hose, where it wraps around the nozzle. The No-Spill can has managed to integrate these safety measures much better than most. The No-Spill nozzle incorporates a push button design with side guards to prevent accidental pressing of the flow button (green). And a squeeze position that requires a more adult sized hand to operate. And push with your thumb. Flow On. The tank cap has a ratchet that requires firm pressure on the edges to move it away from the ratchet post and allow unscrewing. Here’s the two thumb push / rotate technique we found that should allow any adult sized hand to open it without too much trouble. Once you twist past the ratchet notches, the cap will simply unscrew the rest of the way. In the end, most of us buy a gas can and then keep it for years. But because I now have tools that require Regular gas, some Mixed gas (fuel with oil added) or just hold more gas than the cans I had, I bought others. 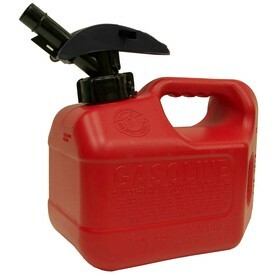 and found the only Safe and “Easy-To-Use” fuel cans on the market. My goal is to help you live with only the products that make life better and easier every time you use them. Because life is just better when you live with The GreatStuffThatWorks! Click the Links Below to see the latest prices at Amazon on the No-Spill cans. And when you buy through one of my links, you get the same low price and help fund my research! 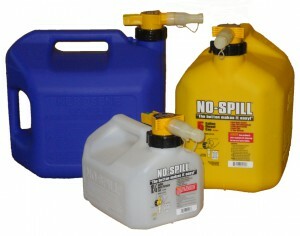 No-Spill also make cans, with the same nozzle design, for Diesel, Kerosene and a variety of other fuels. 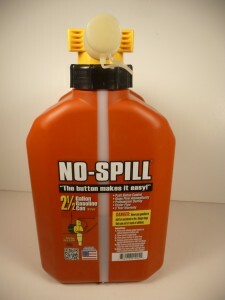 Also, Check My FYI Below For a Tip to make sure the gas you put in your No-Spill doesn’t go bad and gum up your motors. CHECK YOUR PRICE AT AMAZON BELOW! FYI: Ever have trouble starting a mower, snow blower, etc. after it sat unused for a while? Unfortunately Ethanol begins to gum up gas after sitting for just a few weeks unless it is treated with an Enzyme Fuel Stabilizer. 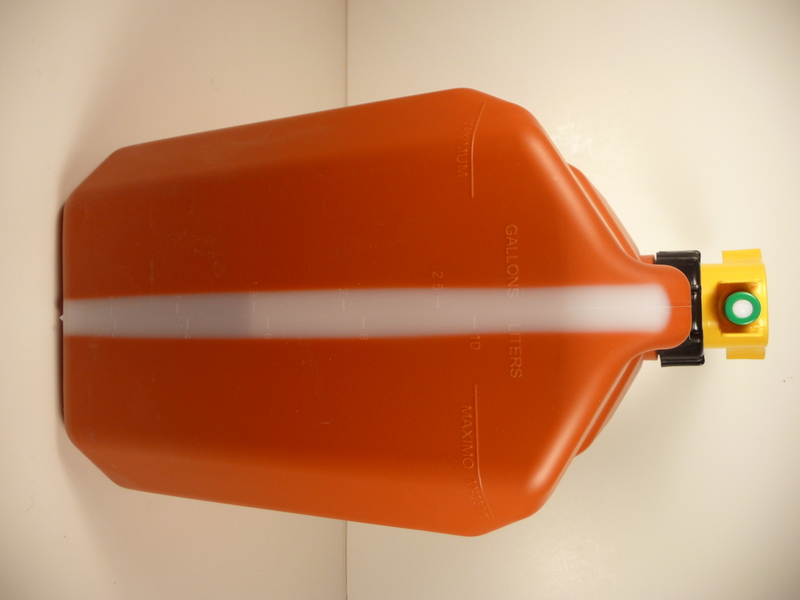 The product is widely available, one small bottle treats dozens of gallons of gas and it can keep your gas from turning to gum for as long as a year with one properly mixed application. Just read the label for the proportion to add per gallon, add it to the Gas Can before you fuel the motor, (Not The Motor’s Tank), and use the motor. Next spring your sleeping mower will be a lot less likely to wake up grumpy. Very good, super helpful review; more detail than on any other site I’ve seen. I’m especially grateful for all the photos and for the description of the cap’s ratchet design. The No-Spil site doesn’t even include a description of the cap. On one hand, your review and my comment may seem like a lot of energy spent on a ho-hum product — a gas can. On the other, for people like me who like to research products before I buy, your effort is totally worth it. Thanks! the old cans are plenty safe. why do we think we are re inventing the wheel.